After months of waiting I was finally lucky enough to get a spot in the spring round of the 4x5 Modern Quilt Bee. It's hosted on Flickr and happens quarterly so if you miss sign ups you have to wait 3 months to try again (which is exactly what happened to me). 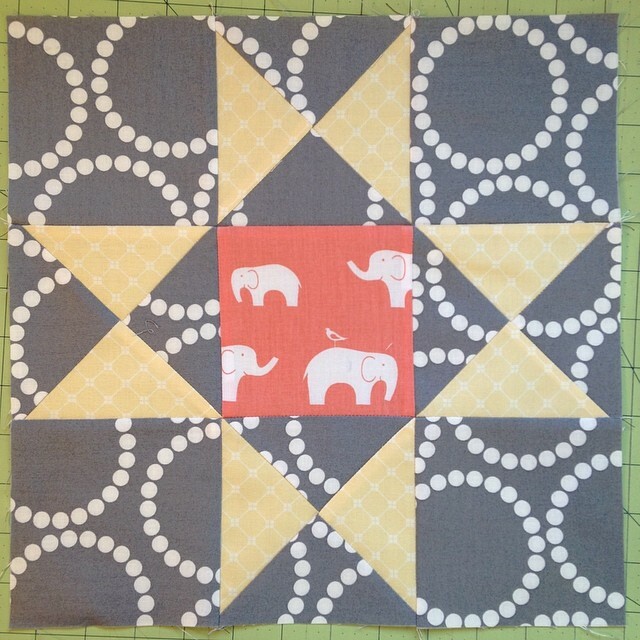 This elephant print is one of the first fabrics I bought when I started quilting a few years ago. I'm glad to be able to show it off in this block. I love this tea bag background print. It's called Tea Bags in Cream, part of the Cream and Sugar collection from Windham Fabrics. The cream print isn't available any longer but they do have the same pattern printed on bright orange. 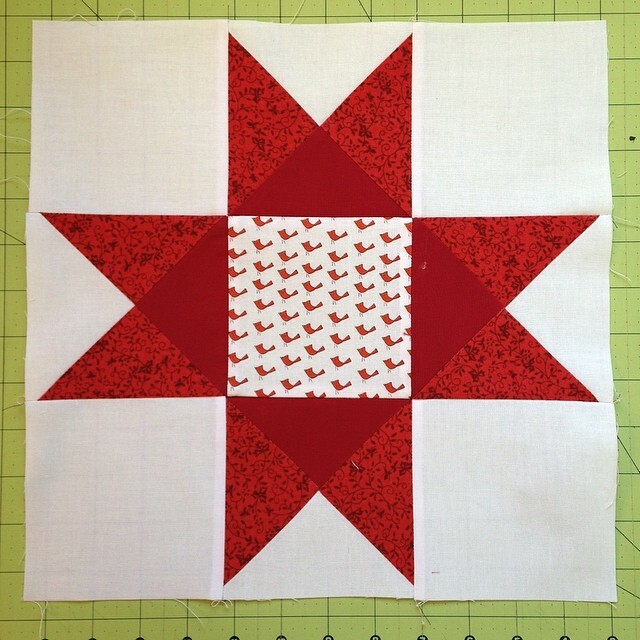 I used some long horded little red and white birdies in this block. I have no idea what project they are from or where/when I got them. 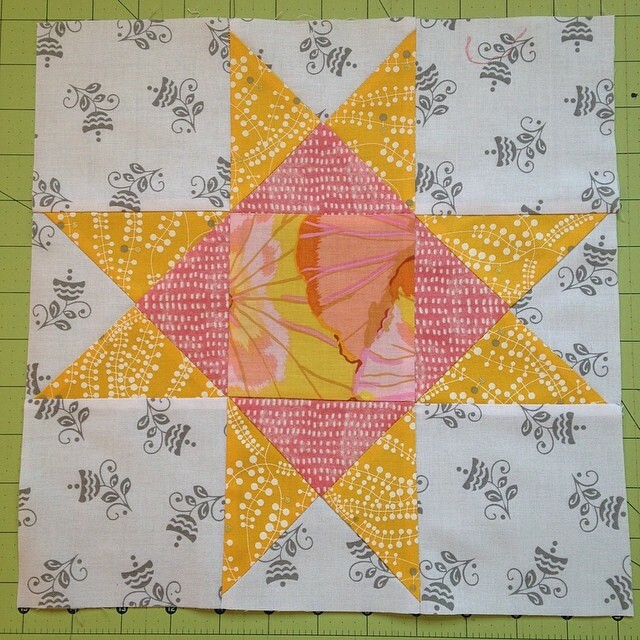 Found the perfect Kaffe Fassel fabric for this block (and to selfishly use in my pink/yellow quilt as well) called Lotus Leaf in Yellow. I adore the little sheep/sheep dog fabric in the middle of this quilt. I've used it in several bee blocks but have yet to use it in anything for myself. That will have to change soon. The large scale background worked beautifully in this block. 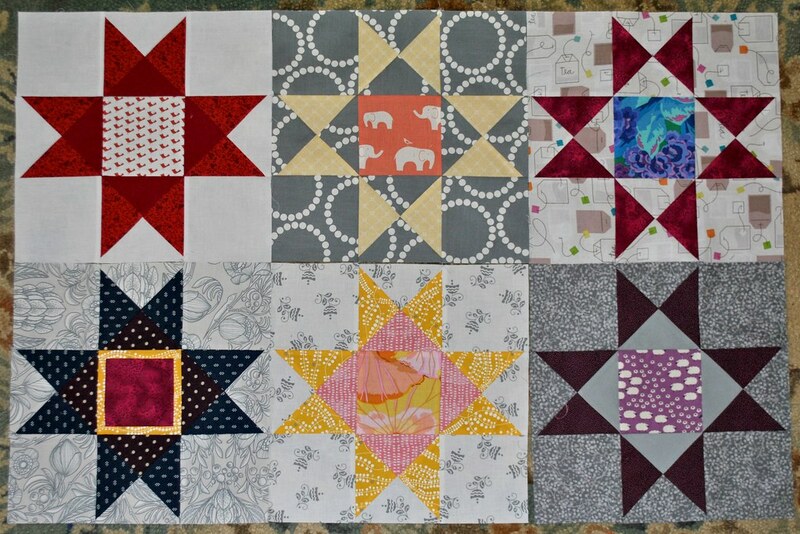 And here are all of the blocks together. I'm linking up with Stitch by Stich for anything goes mondays. Serious eye candy Jen... I love seeing each and every one of your adventures in color! 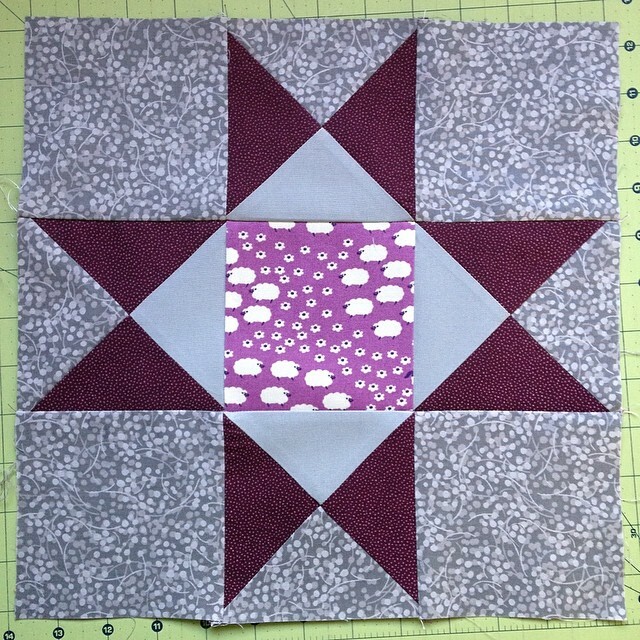 Now that they're done, I'll mail each block out to it's intended recipient, and eventually receive one from each of them in my colorway (the pink/grey/yellow block at the top). 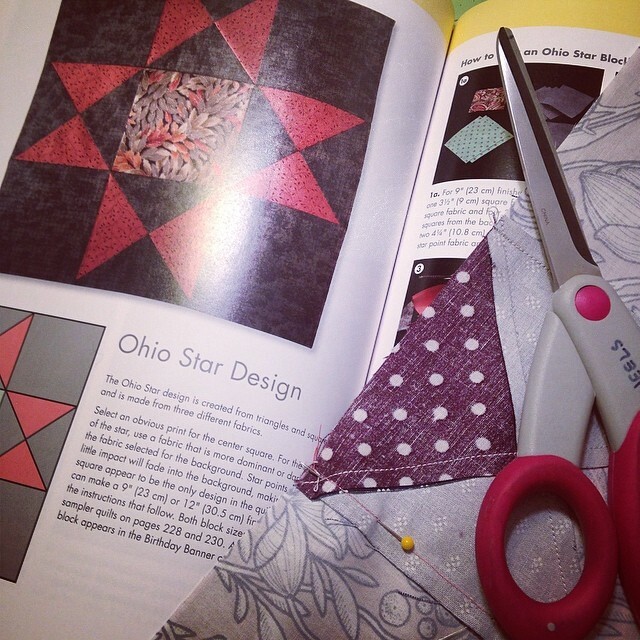 When I'm done I'll have a beautiful sampler quilt! 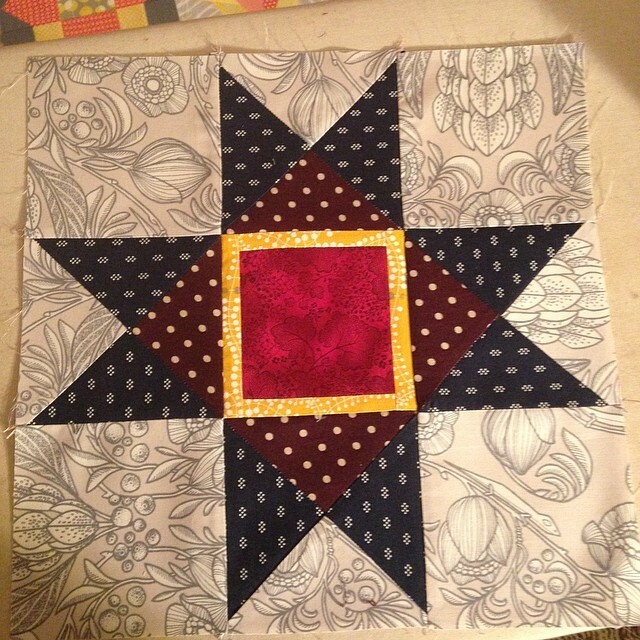 I like your blocks, how even and perfect they look, but more, your fabric choices! 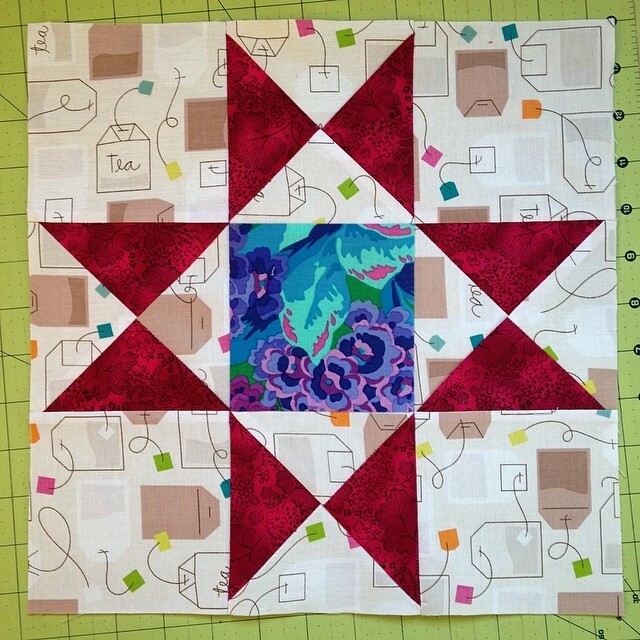 Always nice to see how others put fabrics together and how well they play! !